Stick’n Glide is an innovative display that can be used as a table stand or counter display. 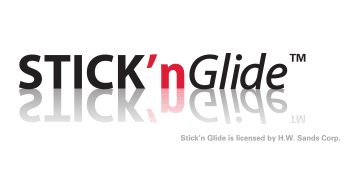 Stick'n Glide will stick – without glue – on any level surface, is easy to move and install and will not fall over or blow away. Stick'n Glide is color-fast and tear-resistant. The display is durable and weather resistant for indoor or outdoor applications.